Reactive Database Access – Part 1 – Why “Async” – Java, SQL and jOOQ. We’re very happy to announce a guest post series on the jOOQ blog by Manuel Bernhardt. In this blog series, Manuel will explain the motivation behind so-called reactive technologies and after introducing the concepts of Futures and Actors use them in order to access a relational database in combination with jOOQ. Manuel Bernhardt is an independent software consultant with a passion for building web-based systems, both back-end and front-end. He is the author of “Reactive Web Applications” (Manning) and he started working with Scala, Akka and the Play Framework in 2010 after spending a long time with Java. He lives in Vienna, where he is co-organiser of the local Scala User Group. He is enthusiastic about the Scala-based technologies and the vibrant community and is looking for ways to spread its usage in the industry. He’s also scuba-diving since age 6, and can’t quite get used to the lack of sea in Austria. Reactive Applications do not exist merely in a wild, pristine green field. At some point they will need to store and access data in order to do something meaningful and chances are that the data happens to live in a relational database. Say that you have an application that runs a simple SELECT query on its front page (let’s not debate whether or not this is a good idea here). If your application and database servers live in the same data centre, you are looking at a latency of the order of 500 µs (depending on how much data comes back). Now compare this to all that your CPU could do during that time (all those green and black squares on the figure above) and keep this in mind – we’ll come back to it in just a minute. Let’s suppose that you run your welcome page query in a synchronous manner (which is what JDBC does) and wait for the result to come back from the database. During all of this time you will be monopolizing a thread that waits for the result to come back. A Java thread that just exists (without doing anything at all) can take up to 1 MB of stack memory, so if you use a threaded server that will allocate one thread per user (I’m looking at you, Tomcat) then it is in your best interest to have quite a bit of memory available for your application in order for it to still work when featured on Hacker News (1 MB / concurrent user). Such a server will not use many threads. For example, default configuration of the Play Framework is to create one thread per CPU core with a maximum of 24 threads in the pool. And yet, this type of server model can deal with many more concurrent requests than the threaded model given the same hardware. The trick, as it turns out, is to hand over the thread to other events when a task needs to do some waiting – or in other words: to program in an asynchronous fashion. Asynchronous programming is not really new and programming paradigms for dealing with it have been around since the 70s and have quietly evolved since then. And yet, asynchronous programming is not necessarily something that brings back happy memories to most developers. Let’s look at a few of the typical tools and their drawbacks. Working with threads in Java is hard, especially when using mutable state – it is so much more convenient to let an underlying application server abstract all of the asynchronous stuff away and not worry about it, right? Unfortunately as we have just seen this comes at quite a hefty cost in terms of performance. In one way, threaded servers are to asynchronous programming what Hibernate is to SQL – a leaky abstraction that will cost you dearly on the long run. And once you realize it, it is often too late and you are trapped in your abstraction, fighting by all means against it in order to increase performance. Whilst for database access it is relatively easy to let go of the abstraction (just use plain SQL, or even better, jOOQ), for asynchronous programming the better tooling is only starting to gain in popularity. 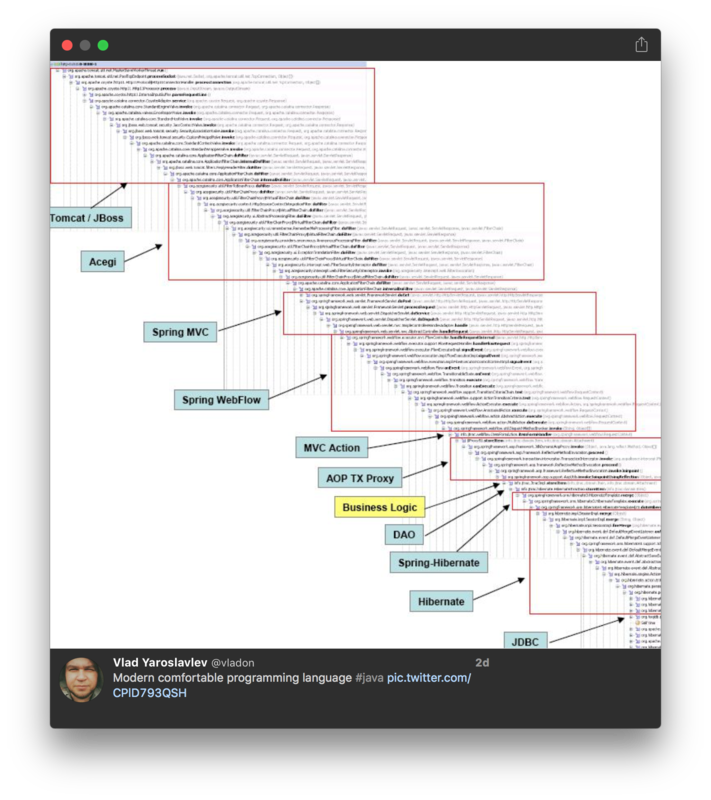 Let’s turn to a programming model that finds its roots in functional programming: Futures. Futures as they can be found in Scala leverage functional programming techniques that have been around for decades in order to make asynchronous programming enjoyable again. A scala.concurrent.Future[T] can be seen as a box that will eventually contain a value of type T if it succeeds. If it fails, theThrowable at the origin of the failure will be kept. A Future is said to have succeeded once the computation it is waiting for has yielded a result, or failed if there was an error during the computation. In either case, once the Future is done computing, it is said to be completed. This call will return immediately and lets us continue to do other things. At some point in the future, the call may have been executed, in which case we could ￼￼access the result to do something with it. Unlike Java’s java.util.concurrent.Future<V>which lets one check whether a Future is done or block while retrieving it with the get() method, Scala’s Future makes it possible to specify what to do with the result of an execution. 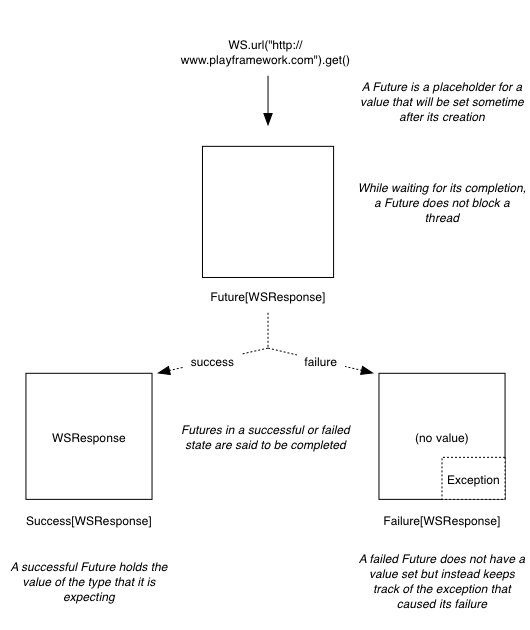 In this example, we turn our Future[WSResponse] into a Future[Boolean] by checking for the status of the response. It is important to understand that this code will not block at any point: only when the response will be available will a thread be made available for the processing of the response and execute the code inside of the map function. At the very end of the Future we call the recover method which will deal with a certain type of exception and limit the dammage. In this example we are only handling the unfortunate case of a java.net.ConnectException by returning a Nonevalue. The allSitesAvailable Future is built using a for comprehension which will wait until both Futures have completed. The two Futures playSiteAvailable and playGithubAvailable will start running as soon as they are being declared and the for comprehension will compose them together. And if one of those Futures were to fail, the resulting Future[Boolean] would fail directly as a result (without waiting for the other Future to complete). This is it for the first part of this series. In the next post we will look at another tool for reactive programming and then finally at how to use those tools in combination in order to access a relational database in a reactive fashion. I am looking forward to the 3rd part oft the blog series already. Thanks! Manuel, is it also possible to access a database with SQL/JOOQ in a reactive “way” not with Scala but in Java? If so could you extend this block series so it also covers Java, including examples? I also saw you published a book. Does it cover Scala only? It surely is possible to access a database in a reactive fashion with Java. That is I have not been programming in Java for about 5 years (and I have no plans to come back to it) so I’m afraid I am the wrong person to ask when it comes to write something about it. Reactive Web Applications also only covers Scala (in practice, I would say that it is very hard to write a book that covers all examples in two languages). Hi Manuel, does your final example of `allSitesAvailable` actually execute in parallel? Because the future (`githubAvailable`) is started in the for comprehension, I’m afraid it won’t kick off until the first completes successfully. Right? heap memory should be stack memory, right?